Quidditch is an exciting and dynamic game that is based on the fictional game of Quidditch popularised in the Harry Potter books. Played by two teams consisting of seven players each, it is designed to mirror the book version of the game as much as possible. The most obvious way this is done is that each player is mounted on a broomstick and attempts to win the game by having more points than their opponents by the time the Golden Snitch is caught (which in this version of the game, is a tennis ball in a long yellow sock). Quidditch is one of the world’s youngest games but one that is growing in popularity all the time. Created in 2005, Quidditch even has its own governing body, the International Quidditch Association (IQA) who are in charge of the sport’s rules and regulations. According to the IQA, the sport is now played by over 300 teams in over 20 countries. The object of the game of Quidditch is to score more points than your opponents. Players do this by scoring goals which is done by placing a slightly deflated volleyball called the Quaffle into the opposition's baskets giving them 10 points, and by capturing the Golden Snitch which is worth 30 points. In Quidditch, each team is made up of 7 players. One Seeker, one Keeper, two Beaters and three Chasers – each of which have a specific task. The Chasers are there to try and keep possession of the Quaffle and to score a goal by throwing it through one of the opponent’s three hoops. They can pass the ball between each other but only one is allowed to enter into the scoring zone at any one time. The two Beaters throw Bludgers and these are thrown at the opposition to disrupt them. The other side’s Beaters, in turn, throw them back with the same intention. The players in this position are usually the strongest and most physical within the team. The Keeper is a defensive player and is tasked with defending the team’s hoops. Lastly, the Seeker is the team member whose job is to capture the all-important Golden Snitch. Broomstick: All players must stay mounted on a broomstick, which can be made out of a variety of materials including wood or PVC piping. The broom must also be held between the legs all the time. Hoops: Three hoops are situated at each end of the pitch, all at different heights (2m, 1.4m and 1m). They are placed approximately two broomsticks apart with the tallest on the left. Quaffle: This is ball in the game that only Chasers and Keepers can utilise. It’s a volleyball that has been deflated and is what the Chasers must try to throw through into the hoops in order to score points. Bludgers: These are slightly deflated dodgeballs and can only be used by Beaters. There are three of them on the pitch at any one time and Beaters throw these at the opposition to ‘knock them out’, which means the opposition player has to stop what they are doing, dismount, and run back to their own hoops and touch them before resuming play. Golden Snitch: This is a tennis ball placed in a long yellow sock, which is then attached to a ‘Snitch Runner’. A ‘Snitch Runner’ is a neutral player who tries to avoid each team’s Seeker, which is the only position to be able to catch the Golden Snitch. Capturing the Golden Snitch ends the game immediately. There are two ways to score during a game of Quidditch. Firstly, the Chasers can score a goal by getting possession of the Quaffle, then entering the opposition's scoring area and throwing it successfully through one of the three hoops. This gives the team 10 points. The second way to score points is for the Seeker to gain possession of the Golden Snitch. Doing so, scores the team 30 points and immediately ends the game. There is a common misunderstanding in Quidditch that the team that captures the Golden Snitch is the team that wins the match. This is technically incorrect, as the winner of the match is the team with the most points. Because the Snitch is worth 30-points and the game ends as soon as it is captured, the winner is almost always the team that captured it. This is not always the case, however, as technically, a team can still win the game even if they haven’t captured the Golden Snitch just as long as they have more points than the opposing team. A game of Quidditch begins with the Quaffle and Bludgers all placed in the centre of the field. Each team’s seven players start in their keeper zone, all with their eyes closed, this is to prevent them seeing where their Golden Snitch is. Each team must then attempt to score more points than their opposition by scoring more goals by placing the Quaffle through one of the opposition nets and by capturing the Golden Snitch which also immediately ends the game. 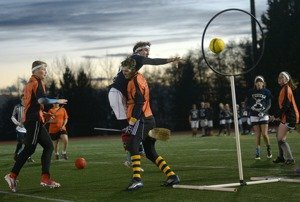 There is no set time limit to the game because of this, but the Golden Snitch is usually caught within an hour, although this can depend upon the fitness and experience of participants. During gameplay, any player that is hit by a Bludger is required to dismount their broom and run back and touch their on nets before resuming play. Quidditch is a full contact game and players can use force against each other in an attempt to capture the Quaffle or prevent other players scoring a goal. Throughout the game, the Seeker from each team’s sole duty is to capture the Golden Snitch and once this is done, the game ends. The winner of the match is the team with the most points at the end of the game.